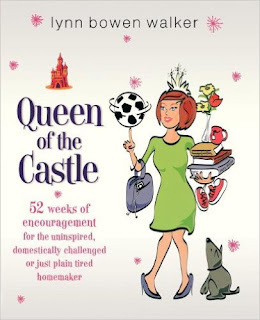 Hello, Queen of the Castle readers. 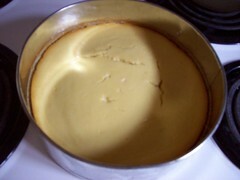 Carol from NO REASON NEEDED here, popping over from my blog to share a Lemon Cheesecake recipe. Originally obtained from Veronica’s blog, La Recette du Jour it was previously unknown to me that cooks in Europe measure dry ingredients by weight, not volume (i.e. cups). Many of her recipes use European standards for measurement; weights are in grams or kilos, volumes are in litres, centilitres, or millilitres, and oven temperatures are in Celsius. Fortunate for me, Ivy from Little Ivy Cakes had used the same recipe previously and had converted the measurements to American standards...THANK YOU!!! 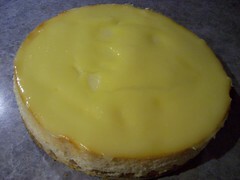 I L♥VE all things LEMON and wasn't in the least bit apprehensive to try her Lemon Cheesecake. -bake for 10 minutes. Reduce heat to 280 F.
-Meanwhile, put all the cheese in a bowl and beat with an electric whisk for 30 seconds to make it smooth and light. Beat in the sugar, then the eggs, one by one, followed by the lemon zest and juice. -Pour into the tin and bake for about an hour (I baked for 1 hour at 280F and an additional 15 minutes at 300F). The filling should be only just set and still a little bit wobbly in the middle. Turn off the oven and leave the cheesecake in it to cool. - When it's completely cold, unmould it and put it on a plate. - Spread the rest of the lemon curd over it and decorate. Mix all ingredients in a saucepan and cook on medium-low heat until mixture thickens and starts to bubble a little(5 mins), mixing occasionally. Remove saucepan from heat immediately and press through a sieve. Stir and then store in a container. Chill at least 1-2 hours before serving. I stored mine in the fridge until I was ready to use. Aside from Dalton (my picky eater)... Dakota, John and I LOVED it. Dakota even went on to declare it being "a little taste of heaven", and somewhat "similar to Lemon Meringue Pie, 're-arranged'"
That said, I was impressed with how EASY this cheesecake was to make and how well it held up, without crumbling upon being sliced. 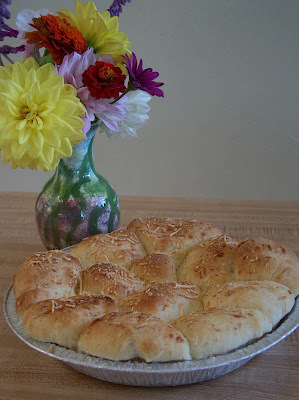 This recipe is a DEFINITE keeper!!! Welcome Carol, and thanks for a lovely guest post! The cheesecake is gorgeous and I love the lemon curd both in the cake and decorating the top! mmm, sounds wonderful! i love lemon cheesecake! What a fun thing to do! This lemon cheesecake sounds delicious! Great guest post Carol. All I can say is Yummmmmmm! I love all things lemon! What a wonderful treat to make for Christmas. Thanks for sharing. Your cheesecake looks delightful. Seeing the lemon curd adoring the top has my jaw tingling. :) I love the tart and tangy flavors of citrus. Ooo, this looks amazing! Just popped over here to read your blog, thanks to your recent comment. Lovely! You bake beautiful things. Happy holidays, Lynn! 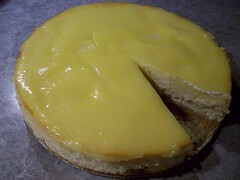 Nice guest post...love the idea of lemon in cheesecake...lighter and not so sweet. Love it! It looks really good! I love cheesecake and I love lemon. This is yummyyy!!! I love cheesecakes!